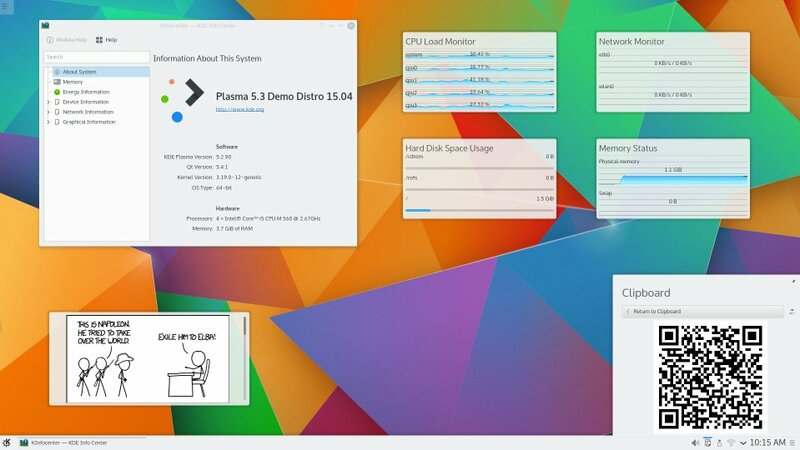 Plasma 5 is the desktop environment of the Kde project and we can certainly say that its development is a source of interest for a big chunk of Linux users since, at the moment, it is found to be at the center of very important changes. And in fact, with this new release we have a lot of noticeable new features and improvements to talk about. Since appearance is the first thing we notice, Plasma 5.3, from this point of view, brings a lot of visual improvements. Clipboard applet has gained support for showing barcodes, the Desktop and Folder View containment codebases has been unified, the Recent Documents and Recent Applications sections in Application Menu (Kicker) has been powered by KDE activities, and the Comics and System monitor plasmoids are again available. Beyond the look, we’ve a lot of interesting improvement regarding the power management. In Kde Plasma 5.3 we can configure different power management settings for certain activities. Laptop won’t suspend when closing the lid while an external monitor is connected, screen brightness changes are now animated, KInfoCenter provides statistics about energy consumption and the Battery monitor shows which applications are holding a power management inhibition. Other important improvements regard the bluetooth management and huge steps toward the support for the Wayland windowing system has been made. We can’t forgot to mention the full working tech preview of Plasma Media Center. Kde Plasma 5.3 will be available on Arch Linux and other linux distros as well in the next few days. As always, I’ll see you here for a more more in depth review of this new major release of Plasma 5.3.